For other uses, see Tikka (disambiguation). Paneer tikka served in a restaurant in Mumbai, India. Tikka (Urdu: تکہ‎) (Bengali: টিক্কা), (pronounced [ʈɪkkaː]) is a type of food from the Indian subcontinent. It is also known as teeka or teekka. "Tikka" refers to a piece of meat, such as a cutlet. The popular dish chicken tikka is made of chicken cutlets in a marinade. Vegetarian varieties are also popular. A westernised version, chicken tikka masala, a curry, is a widely popular dish in the United Kingdom. The marinade used in the preparation of chicken tikka is also sometimes called tikka; it is made from a mixture of aromatic spices and dahi (yogurt). 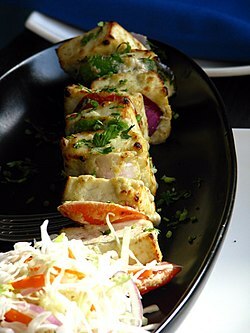 Paneer prepared in a tandoor is also known as paneer tikka. Tikka prepared with meat is known as Kebab. The major ingredient in vegetarian tikkas is potato. The tikka or kebab is deep fried. Kebabs are a popular dish in Mughlai cuisine. This Bangladeshi cuisine–related article is a stub. You can help Wikipedia by expanding it. This Pakistani cuisine–related article is a stub. You can help Wikipedia by expanding it. This page was last edited on 15 March 2019, at 08:59 (UTC).